Naturally, we don’t want our online accounts to be hacked. However, I don’t have a bill pay account with Chase. For fun, I thought I’d assess the quality of the phishing attempt. It’s a goodie; but not perfect. The fact that the “Service” at risk list appears as a bulleted list is expected. But but the actions / information are part of the same bulleted list, which is suspect. If you ignore that bit, the only other suspect bit on the solicitation email is the URL to which the “Login Now” button posts; only available after a “View Source”. Non-technical users may well click this link. If they do, they haven’t done themselves any harm as of yet. The fact the page is served over http (and not https) should clue the user. If not, the .cn domain suffix should raise a red flag. Besides those two deficiencies, EVERYTHING else you see on this page is legitimate: the images, all the links to get more information, sign up, view demos, even the user id / password retrieval link. 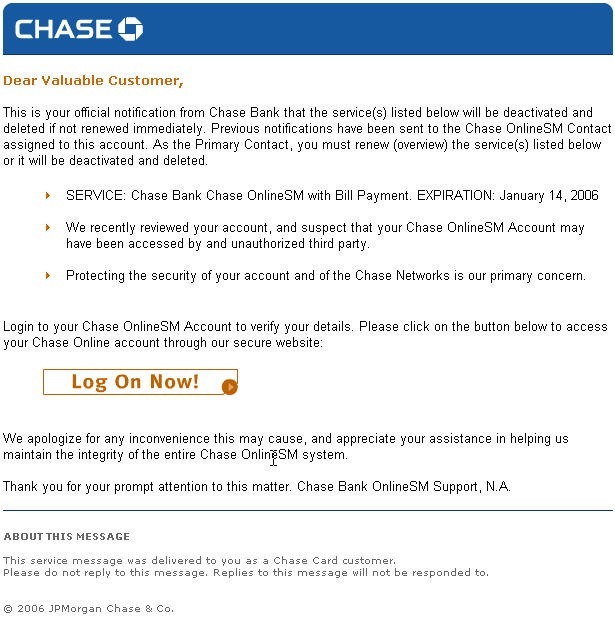 The links and images direct you to the proper pages at the Chase.com site to support the illusion. Watch your inbox and be careful.